The appointment of acting Attorney General Matthew Whitaker may be delayed to the government shutdown. Photo Credit: Douglas Graham/CQ Roll Call file photo as reported by Roll Call, 1/11/19. In December, a federal judge in Texas struck down the Patient Protection and Affordable Care Act, but under appeal, the status of the health care law remains in limbo during a partial government shutdown. 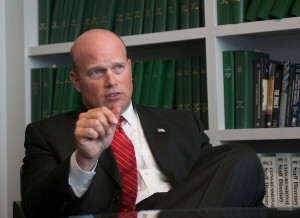 “The partial government shutdown halted a major challenge to the 2010 health care law among other civil litigation on Friday, as Justice Department lawyers sought the same in a challenge from three Senate Democrats to the appointment of Matthew Whitaker as acting attorney general,” reports Rollcall.com. “The federal court system will start feeling the crunch of the shutdown on Jan. 18 when the Administrative Office of the U.S. Courts estimates it will run out of the court fee balances and other non-appropriated funds that so far allowed for regular operations,” notes an article by Roll Call.